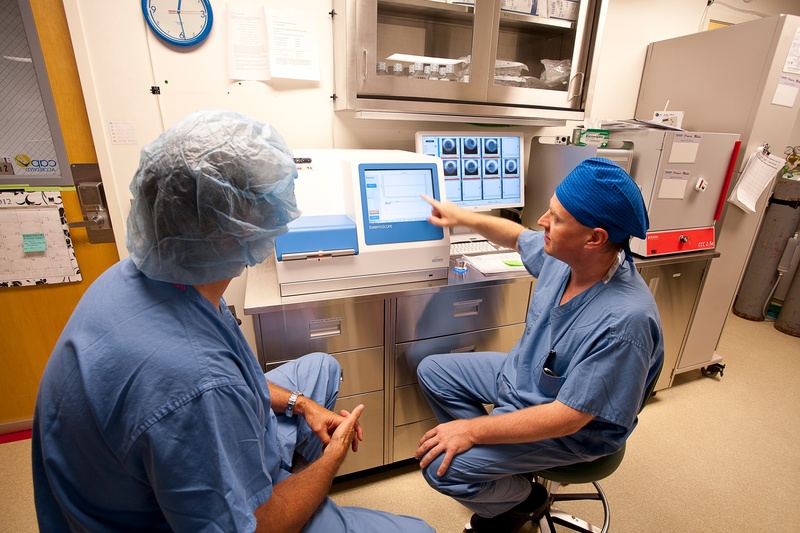 New IVF Technology: What Is the EmbryoScope? Infertility specialists and researchers are constantly looking for new ways to help patients realize their dream of a successful pregnancy. This drive for improvement has led to many new developments in the science of Assisted Reproductive Technologies and in the tools available to fertility clinics. Every now and then there is a breakthrough which offers new hope. The EmbryoScope is a perfect example.This high-tech device is used in the IVF laboratory during the incubation period between fertilization and implantation. The EmbryoScope allows infertility specialists to monitor the progress of fertilized eggs around the clock without ever removing them from the protected incubator. This cuts down the risk of anything going wrong, and gives doctors and patients insight into how the embryo is developing. For some patients, it may improve their chance of carrying a pregnancy to term. After the egg retrieval procedure, the eggs and sperm (from the partner or donor) are mixed together in the IVF lab so that fertilization may occur. At this point, they need to be placed in a protected environment so that they can begin to develop safely. The EmbryoScope is a special type of incubator which supplies the ideal nutritional and environmental conditions for embryos to grow outside the uterus. With the EmbryoScope, the embryos stay in the incubator throughout the 5-7 day incubation period. The Embryoscope takes pictures of the embryo every 5-10 minutes. These images are then strung together into a small time lapse movie which distinguishes the time frame in which the development occurs. This allows an embryologist to monitor the cell divisions and development of each embryo constantly while the embryo is still safe in the incubator. Being able to watch the embryos grow without exposing them to conditions outside the incubator is a huge benefit, but it is only the beginning. Learning algorithms are constantly searching the data for patterns, and growing evidence suggests that there are certain key time points in development that are tied to positive or negative results. This means that the EmbryoScope can help an embryologist predict chromosomal abnormalities. It also tells the embryologist a lot about the further development and pregnancy potential of each embryo. These crucial time points can only be fully recorded with the help of the EmbryoScope’s time lapse camera. With the aid of this priceless information, the very best embryos can be selected for transfer, and patients can be given a significant amount of important information about the viability of the chosen embryos. For some patients, this improved selection process may make all the difference. How are embryos selected without the EmbryoScope? In a routine IVF cycle, the fertilization process occurs in the same way, with retrieved eggs and sperm that are combined in a sterile dish filled with a special culture medium which offers the right nutritional conditions for growth. The embryos are left in the culture in an incubator, which copies the conditions inside a woman’s body. In standard IVF, the embryos are removed from the incubator at set intervals to check on their development under a microscope. These periodic observations allow embryologists to tell which embryos are most likely to do well when transferred back to the patient’s uterus, resulting in pregnancy. As soon as the embryologist has completed each examination, the embryos must be returned to the safety of the temperature and light controlled incubator as quickly as possible to avoid any potential damage to the developing cells. The best IVF labs are also strictly restricted and controlled environments so that the risk of damage is reduced. What are the advantages of the EmbryoScope? As we said before, the EmbryoScope is a sophisticated way to improve the embryo selection process. It can help experts identify potential chromosomal abnormalities, and offers more valuable information about the embryo, the way it is developing, and its potential to survive transfer and implantation. Keeping the embryo in a controlled and protected environment at all times also helps to eliminate risks involved in moving and examining developing embryos. Which patients will benefit from the use of the EmbryoScope? Preliminary research has shown that while the EmbryoScope may offer an improvement in results, the chance is highest among patients who produce more embryos. Although the technology can be used for any and all types of patients, its benefits are best seen when people have a lot of embryos to choose from. Your doctor will be able to advise you whether this is the right choice for your IVF cycle.